In 1998 a group of American veterans joined their former Vietnamese enemies on a bicycle ride from Hanoi to Saigon. They rode through villages and countryside, much of it unchanged since the war. The venture was documented in a recently released video, “Vietnam: Long Time Coming,” from Kartemquin Films. Villagers waved and children, who had been playing in the paddy fields, ran shouting and laughing towards the stream of brightly clad cyclists. These idyllic scenes highlighted the enormous shift in perspective between the past and the present. Outside, in the world around them, the world seemed peaceful, while much of the real drama was taking place inside their minds, where memories boiled and occasionally erupted into tears. I empathized with the courage it must have taken to face the country where deep scars were burned into their psyche, and several times I cried along with them. George and the others who returned to Vietnam for this ride were reaching out towards a new relationship with this place where their lives had been changed forever. Through the documentary movie “The Long Time Coming” I was able to witness that experience and gain a deeper understanding of the psychological aftermath of war. This may seem like a highly specialized concern, but the pain spills out to family, friends, and the community. People are affected for decades when combat veterans feel that they have crossed over a chasm that can only be traversed in one direction, and once on the other side, they cannot find their way back. The existence of that pain in my fellow human beings stirs my desire to understand more. The movie “Long Time Coming” illustrates that revisiting the past is one of the tools that can help heal in the present. Even though you can’t always return to the scene physically, you can create some of the same effects by writing. Visiting the past through writing can enable you not only to recreate the situation, but also to apply to those memories some of the wisdom you have gained in the intervening years. In some cases, building bridges backwards through time can create a pathway from pain back into hope. While the most obvious healing strategy of the movie was simply revisiting the scene, there were other strategies being employed. One of the American veterans was a psychologist who conducted meetings and spoke individually with the American vets who were trying to cope with their emotional wounds. The discussions with each other and with a therapist helped them reorganize the thoughts and feelings awakened by this experience. And their connections, friendships, and warmth with former enemies soothed some of the war wounds, as well. He didn’t mean just climbing a mountain on a hot day in a bicycle built for someone without legs. He was surrounded by loving new friends, the honor of being part of a team, the rapprochement of former enemies reaching out to each other. It was a healing moment for him, and for me. Writing Prompt: Write about a time when working together towards a common goal made you feel closer to someone. Writing Prompt: Select a memory that you have bad feelings about, and pretend you are writing fiction. Applying your wisdom and imagination, reorganize the events so that this character learns some powerful lesson, or accomplishes or triumphs in some way. An excellent book for understanding more about PTSD is “Achilles in Vietnam: Combat Trauma and the Undoing of Character” by Jonathan Shay. Because of the profound effects of PTSD, neurologically and on the very foundation of character, many of the methods in psychology are not sufficient to unravel the damage wrought by combat. And yet, there is much research and compassionate work that has helped veterans suffering from PTSD. In addition to helping them cope with their specialized needs, I believe these therapies and strategies can help other people who suffer with an irreconcilable relationships with painful memories. For more about revisiting the past, see my essay about the movie Pursuit of Happyness, which portrayed Chris Gardner’s life. For him, it was a return to the trauma and triumph of his youth. After finishing the memoir, Shades of Darkness, I felt I had learned a lot about the author, George Brummell, as a person, his cultural experience growing up in the segregated south. His ticket out to the larger world was the United States Army. I could feel him growing up in Korea. 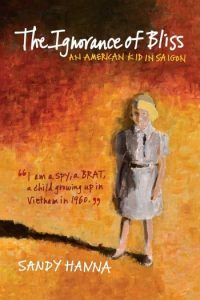 It was a nicely told coming of age story, and then, just when it looked like he was turning into a real adult, his life exploded in a landmine in Vietnam. He was blinded and maimed, and then when he returned, he had to invent himself again. Through the magic of memoir he took me on his journey, as he kept growing. He graduated from college, became director of the Blinded Veterans Association, and wrote this memoir. I knew he was lecturing and outreach to encourage others to tell their story. To find out more about his experience writing the memoir I set up an interview. He has a melodic voice, and as he was speaking each sentence, I could almost hear him lining up the next, so his thoughts flowed together in a lovely, somewhat unusual sort of continuum. Here is what he said when I asked him to tell me about writing his memoir. GB: “When I came back from Vietnam I wasn’t doing too well, and writing the memoir helped me organize my thoughts. Putting my thoughts on paper was elevating for me. It was quite therapeutic. I needed it at the time, especially those times that were not the best for me. When I began to write it had a tendency to take away my thoughts, and I could drift back to my childhood days and think of things that I could probably have done a little bit better. It was just exciting to be able to see what I have accomplished in writing. When I first started writing I often thought how difficult it would be to organize my thoughts and not repeat myself. I thought that would be a real challenge. I like challenges, and that was a challenge to me to do that. I was in college at the time, I felt it was a way to improve my life. Writing is like driving or a lot of other things that we do. In most cases, the more you do it, the better you get at it. Writing the book prepared me for the career that I had with the Blinded veterans association which required me to do a lot of writing. After so much practice I found myself in a position to be able to write a little bit better than a lot of my peers. It also helped me in terms of promotion, because a couple of times they asked the applicants to write what they could do for the organization, and I was able to express myself fairly well. I knew as a blind person a lot of what I was going to do in my life would require me to speak, because as a blind person a lot of things you cannot do with your hands, other than a lot of manual labor, and I wasn’t interested in that. I found that in order for me to improve my speech, I had to read. And of course writing was an adjunct to that. The more I wrote, the more I was able to organize my thoughts and to be able to speak. GB: Not really. As a youngster, living with my grandmother, she was illiterate, and I wrote letters to her daughter and sisters. They were in Philadelphia and she didn’t have a telephone. Otherwise, my only writing class was a remedial writing course, which I took because I was a high school dropout and then in college I took English 101 and 102. When I took the remedial writing course, I was recording my memoirs at the time, and I asked the instructor to let me use those recordings as my English assignment. My instructor thought my writing was quite interesting. Then in English 101 and 102, the instructor let me use recordings as well. After that, I took a non-credit course in creative writing. Again, I was able to submit papers for that class from my own material. By that time I was hooked. And as a social work major, I had to do a lot of writing, and a lot of editing. I really enjoyed editing. I worked with my writing person to get my coursework on paper. I went through it with her, and she retyped it, and I edited and she retyped it. So I had a lot of editing experience while I was in school. JW: And that skill shows in your book. GB: That’s the only training I had, other than what I got from my own experience. I thought I could write a book better than the ones I had read, such as, “If you can see what I hear” – hell, I could write my own experiences. Why not do it from the point of view of an African American? See www.georgebrummell.com for more information and excerpts from his book.